Ambitious young Mage Samara hits a dead end in her research to unlock the secrets of a recently unearthed arcane manuscript. Out of options, she commissions Darian, a warrior of the Manu tribe, to lead her to one of his people's renowned seers. The secret they discover, however, leaves them hunted at every turn as they become entangled in a plot to tear open a portal to Hell, releasing a legion of bloodthirsty demons upon the world. Thrown into a struggle neither fully understand, and complicated by a mutual attraction that neither will acknowledge, the pair must race hundreds of miles before the sun rises on the equinox to head off a cataclysm that only Samara can stop. That's assuming Darian can keep them both alive long enough to reach their goal. But between assassins, demons, fae, and the very land itself trying to kill them, the odds are not in their favor. 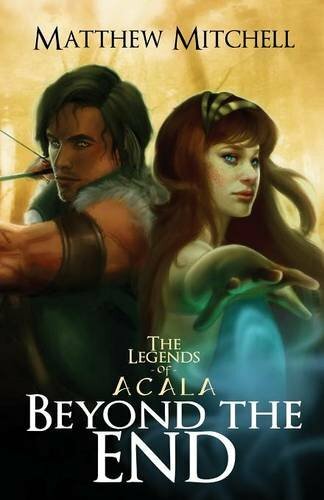 Beyond The End, The Legends of Acala Coin T-Shirt! Coin symbol from Beyond the End, the Legends of Acala! Symbols of the great houses and deities from the book. Art by Jeremy Gotwals, Creative Director at Holon Publishing. Beyond the End Book Cover T-Shirt! Feast thine eyes upon the most epic artwork of Kathryn Lee Steele! Adorn thyself in the finest threads forged by any tailor known to Man or Elf! Well... maybe we're just a little bit excited about the release of Beyond the End by Matthew Mitchell. Don't you want to join the excitement? Get this awesome T-shirt today!